$24.99 In stock. Order in the next 1 hour, 41 minutes and it will go out today! We pre-sold the book at The Session 2014, and we sold through our entire stock in under fifteen minutes. Now it is finally available to the magic world. The spread cull was always a sleight of last resort for me, as I had simply never managed to master the technique. Close Culls got me over the hump. By far the best explanation of the technique (and the rationale for it) I have seen! I'm not as impressed with some of the applications of the technique in the book, but I got my money's worth in the first chapter. Also, as a statement of personal preference, what a RARE TREAT it is in the era of "quicky instructional videos" to learn a move from the printed page! Thanks Josh, Andi, and most of all Harapan for taking the time and putting in the necessary effort to produce this important work! 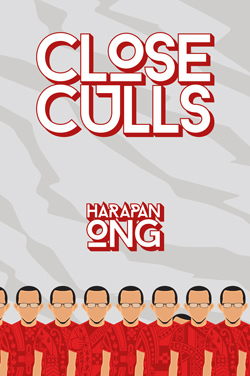 Harapan has some fantastic work on the cull. The ideas are innovative, efficient and above all, practical. Two of my favourite ideas in the book include how to switch a card sandwiched between to face up cards in the centre of the deck, and a way of loading multiple cards into different places in the deck as you spread the cards. There are lots of other good ideas throughout the book too. It is written very clearly and the instructions are easy to understand. Highly recommended! Within the 118 pages, Harapan has contributed some outstanding efforts to "cull-workers" who are still looking for ways to improve their knowledge and mechanics. The move "Buckle Replacement" worth the price of the book and it has significantly enhanced the world of cull. Still reading the reviews? Go get one now and make sure it sits in your library from now on.